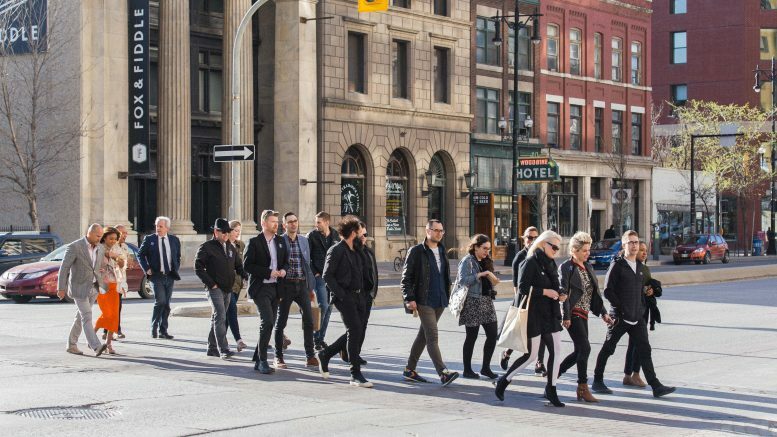 A group tours businesses that exist in the Design Quarter as part of the project’s official launch event. Design Quarter will be hosting a free market at local furniture store HUT K SPACE March 24 to highlight some of the businesses that central Winnipeg has to offer. Design Quarter is a non-profit organization created in May 2017 to bring people to the heart of the city. The goal of the organization is to attract tourists and locals alike to creative destinations in central Winnipeg by demonstrating that Winnipeg is a walkable and design-focused city. Executive director Zephyra Vun said that while Design Quarter is often mistaken as an organization only focused on the Exchange District, it also includes businesses from The Forks and Downtown. “While the density of our members certainly lie in the Exchange [District] currently, our goal is to highlight this entire, walkable community of local makers and design entrepreneurs,” said Vun. The intention of the market is to educate design-savvy locals about the businesses that exist in the Design Quarter, and to provide support and networking opportunities for the businesses that already exist in downtown Winnipeg. “We thought this market would be an excellent way for the public to get a taste of what Design Quarter is all about,” said Vun. The market is set to include a selection of Design Quarter’s 55 members. Among the many market participants are Bronuts and Cake-ology providing free desserts, Winnipeg Architecture Foundation and Cinematheque, screening short films, and The Hammond Building hosting an artist doing live interactive art. The market will not be set up like a typical market, with rows of vendors selling their wares, but rather to provide an experience more similar to a fair, where people can interact with the business owners and learn what they are all about in addition to purchasing products from Design Quarter members. Attendees are encouraged to explore the Design Quarter after leaving the market to see what other local businesses it has to offer. “Nowadays, people crave products that are not only produced locally, but that are unique, made with care and attention to detail, and that come from businesses whose practices benefit the community at large,” said Vun.